Kabul, Afghanistan – Almost everywhere you look in the Afghan capital, Kabul, there are thick and tall blast barriers made of concrete. They are a sign of the precarious security situation in the city of more than four million people. With every blast that shatters the calm of the city, more barriers go up changing the face of Kabul further. 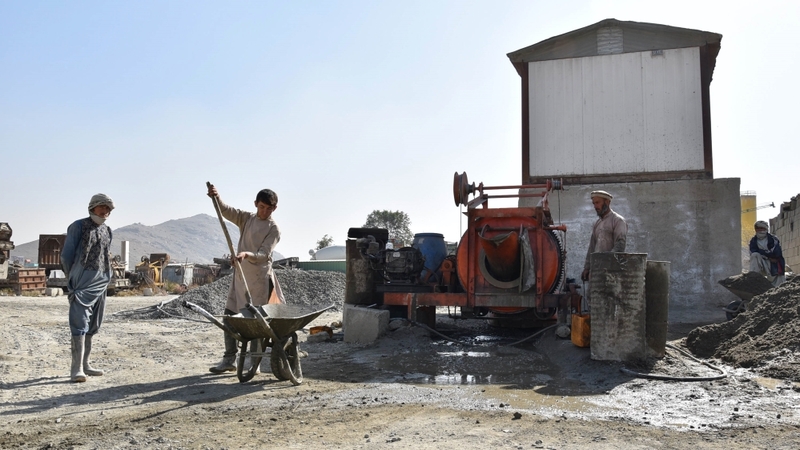 In the city’s industrial area not far from Hamid Karzai International Airport, Muhammad Naseer is hard at work pouring concrete from a wheelbarrow into a T-shaped bowl made of steel. He is making a three-metre tall blast barrier, commonly known in Afghanistan as a T-wall. They are the most popular version because they are the first line of defence against suicide bombers and demand is steady. “I am trying to make as many T-walls as I can,” the father-of-seven told Al Jazeera. “I’m paid 700 Afghanis ($9) for making each T-wall. I am the only breadwinner and I am satisfied,” the 49-year-old added as he rushed to refill the wheelbarrow with concrete. Demand is usually high. On a quiet day a group of workers make 20 barriers. Each month, they sell more than 600. On a dusty patch of land next to the highway and not more than one-kilometre long, there more than six companies rushing against time to make barriers. Until two years ago, Nazeer Aria worked for the government as an engineer building roads. But seeing how the security of the country was not improving and sensing an opportunity, he resigned to start a business that solely made explosion barriers. “Because of insecurity, explosions and attacks I started to make T-walls, bomb barriers, bunkers and guard towers to prevent major destructions that explosions cause,” the father-of-four told Al Jazeera as his employees worked in the distance. “There are different kinds of barriers, different quality and sizes. They have different prices depending on what the customer wants. The cheapest is $180 and it can go up to more than $1,000.” he said. Aria says he is providing an essential service and without his business, security would suffer. “These barriers are saving lives. We’re trying to save lives and these barriers are efficient in maintaining security. We are doing our best to save human lives,” he added. But business was better before NATO ended its combat mission in the country in 2014. “The price of the barriers has gone down recently because many foreigners have started leaving Afghanistan,” Jafar Danesh, who also makes barriers near the airport, told Al Jazeera. “Before, the cheapest barrier was $300. Now it is only $150. Foreigners paid more for barriers. Now most of our customers are Afghans.” he added. The grey barriers hug the walls of every business and institution in the city – from hospitals, to schools to the homes of prominent people who say without them, they would be targeted by armed groups. “We are in a complicated war. Our country is facing a lot of problems when it comes to security. The barriers are for my security and not for anything else,” Nazeer Ahmadzai, a lawmaker, told Al Jazeera. But others think the blast barriers are ruining the city’s appearance, making the capital look like a frontline and a warzone. “Now everyone is putting up barriers next to their houses and offices. Anyone visiting the city will say what are these barriers for? They make the city look ugly and cause traffic problems too,” Muhammad Yonus Nawandish, former Kabul mayor, told Al Jazeera. But the blast barrier manufacturers say their contribution is as essential as an ambulance. And they are not in a rush to give up their trade. “Insecurity harms everyone, even us. We get sad whenever an explosion happens. Everyone wants peace and security. If we have security, we will give up this business and will start to build roads, bridges and whatever that is in [the] interest of our people.” Danesh said.